Browse: Home / Network With LGBTQ Professionals at Corporations Come Out! 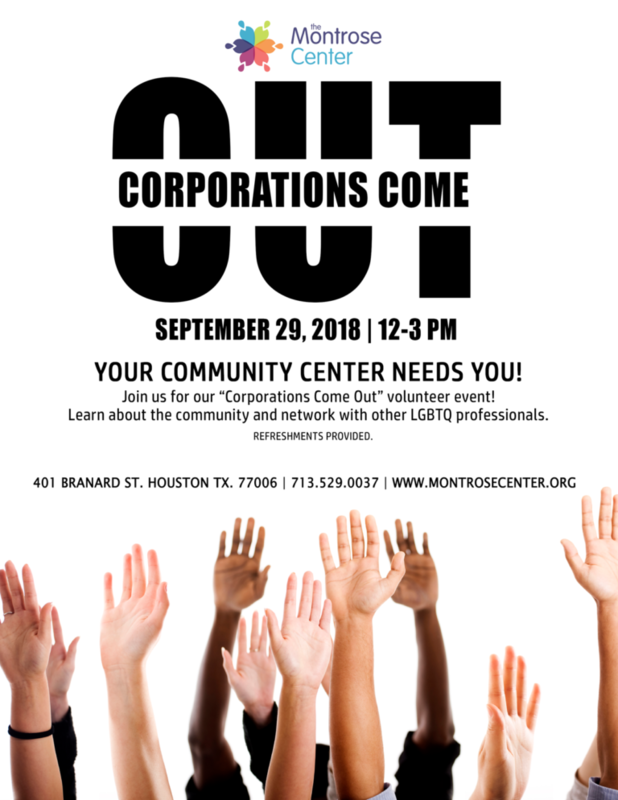 It’s that time of year where we invite all of our corporate employee resource groups (ERGs) to our 2nd annual Corporations Come Out event! This is a volunteer event for ERGs to engage and network with other LGBTQ+ professionals at the Montrose Center. We need your help with volunteer projects around the Center and you will also learn more about your community center. We can’t do this without you! Ways to help the Center include donating food for our HEB Emergency Pantry, hosting a benefit, and sponsoring a SPRY member’s birthday party. Click here to see a full list of how you can support us, and we hope to see you at our events! ← Join us for our Volunteer Meet & Greet!